Internet of Things has established itself as the technology that is out to connect the world across industries across the globe. No matter what Tech Trend Report you take up for 2019 and beyond, IoT mobile app will be present everywhere in every popular technology trend list promising a world that is connected with each other. And would be prepared to present opportunities that are aimed at bringing the control of every machine and device that a user works with on their smartphone. The awareness and demand are such that the query on How IoT works have been replaced by How much does it cost to develop IoT application. A primal contributory reason behind this current state of IoT application development services promising a picture of high growth in the technology’s future is the scope of applications that are shaping IoT’s mass adoption in the world. IoT applications are transforming lives. Let us look at what those IoT Applications or Use Cases are. Machine to Machine component has always been an irreplaceable part of the manufacturing industry. The capability of streamlining processes and tracking everything real time is something unmatched when IoT is added in the Manufacturing domain. Example of this IoT inclusion in the manufacturing industry can be seen in how production tasks are implemented. Such IoT app solutions comprise of digital product quality control mechanism, product equipment management systems, and asset management system etc. There are a number of innovative technologies that are constantly being introduced in the Healthcare industry, straight from AI having an impact on the industry to Blockchain ready to transform the Health and Care industry, the domain has become a constant recipient of innovation. Coming back to IoT, the technology is being widely used for the creation of applications used for the status monitoring of patients, temperature monitoring, diagnostics, keeping a check on UV radiation and radiation in the medical product storage along with the analysis of environmental condition. A real-life example of IoT in EHR can be seen in Ochsner Health System who have integrated EHR system into devices powered by IoT technology to monitor patient’s health. They make use of Wireless scales and cuffs to monitor the vitals and then feed the data directly into every patient’s medical record with the help of the patient’s smartphone. The data is then remotely monitored by doctors, health coaches etc to track potential problems. The Retail domain opens up a number of opportunities for the Internet of Things application development based on the Internet of Things technology. There are a number of trade processes like Supply Chain, Intelligent shopping like – the creation of good collection on basis of location, the price that consumers would be willing to pay and the individual customer characteristics, which are made possible by adding Internet of Things in the Retail sphere. Smart homes are anyway one of the most popular applications of the Internet of Things and the popularity is only going to grow in the near time. Software used for keeping a check on electricity, gas, water, or remote control system and security are all a part of the Internet of Things ecosystem and are poised to lower the need of human intervention by becoming a common attribute for the everyday life. The sale of connected cars is estimated to reach about 72.5 Million by the time we reach 2023. A number of new vehicles making an entry in the automobile industry across the world will have a number of connected car features such as – Wi-fi connectivity, location tracking, emergency dispatch, remote ignition, gas price comparison, remote parking, and anti-theft geo-fencing, among other features. A primary driver if the Enterprise IoT innovation is smart supply chain. A Forrester study showed that IoT supply chain would amount to 25% of the complete IoT spending made by the enterprises by 2023. IoT is all set to bring about two major benefits to the Supply Chain domain – Operational Efficiencies and High Revenue. In terms of bettering the operational efficiencies, you can look at following areas – A. Asset Tracking B. Vendor Relation C. Inventory and Forecasting D. Connected Fleet E. Scheduled Maintenance. And when we talk about generating higher revenue, what we really mean is an expansion of the business model. You can add a segment for the buyers to see where their product has come from – the process, the cities it crossed, etc. These 6 applications are only those that we are forecasting to have a higher chance at adoption and revenue. The IoT industry, however, is not limited to 6. There are many other applications of mobile apps for IoT. Now no matter what the application is, the platform needed to make them come true are indeed limited. With the ever growing popularity of the IoT market, the industry has started flooding with platforms aimed at deployment of applications which monitors and controls all the connected devices and systems. The Azure IoT Suite is made up a number of IoT development services like Stream Analytics, IoT Hub, Notification Hubs, Machine Learning, and Power Business Intelligence. The platform holds the ability to power a great number of operating systems and devices which allows for visualization and analysis of a great amount of data. Azure IoT suite is also used by a number of IoT app solutions providers for the scalability from the POC to much larger deployment stages. The platform allows you to secure a number of different connected devices. It enables the developers to have complete access to information management, connectivity, and instant data analysis in addition to security and risk management. All the real-time information that is collected from the various connected devices gets managed, configured and then integrated with the data services. The platform has enabled developers with the opportunity to safeguard the integrity of the IoT app solution. This is one of the most popular IoT platforms present in the market which offers a very reliable and cost-effective infrastructure in the cloud. Because of the high scalability feature that AWS comes with, it gets used by hundreds of business across the world and the flexibility of cost-effectiveness facility that it comes with makes it an ideal option for the IoT app developers. With the cloud service that Oracle offers, you can get flexible IoT Network topologies, stream processing, control & command functionality, and the simulation of the virtual device. Moreover, it enables the users to gather data safely from a number of devices in the market by technical abstraction. Oracle’s IoT is already integrated with the Oracle PaaS and the on-premise apps which use open APIs, thus offering real-time analytics through big data processing. 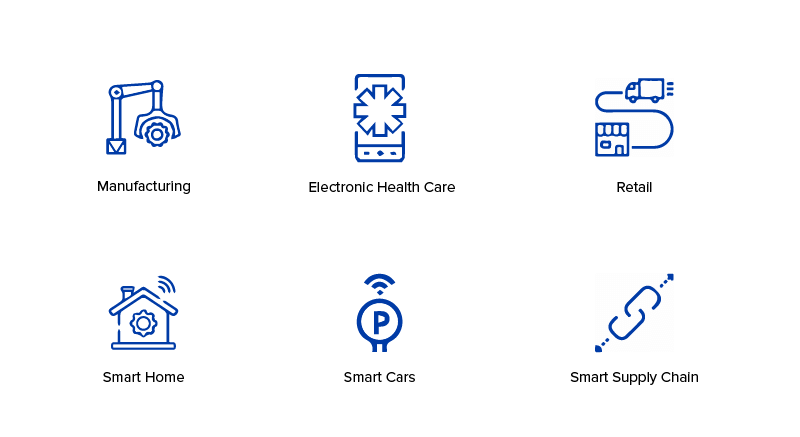 The open source IoT platform offers a one-of-a-kind development experience for the end-to-end IoT app solutions, connected applications, and smart products. The platform doesn’t just have a feature-rich toolkit but is also customizable according to a number of different business applications and fits in a tight budget. In addition to all of this, the platform also offers direct and easy hardware integration to the developers. Now that we have seen the market capital that the IoT technology comes with and the platforms that will make you a part of the surging domain, let’s get materialistic. Ultimately, irrespective of what business domain you are looking to connect with and using whichever platform for development, the end outcome that you are looking to achieve is to generate high revenue. And why not, after all, IoT application development that comes with a slew of the connected ecosystem doesn’t come free of charge, so it’s only viable for you to be clear of how you would get your invested money back and grow it further to back your expansion. 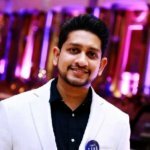 How To Make Money off Your IoT Application? It is one of the most common ways of monetization that businesses apply. What happens here is that businesses offer a new product which can be tracked through a mobile app and then the product is sold at premium prices. An example of this can be seen in Sleep Number IT Bed. The mattress consists of sensors which track the number of different biometric data and then accumulate them to list out the heart rates, users’ breathing, and sleep status, which they can track from SleepIQ mobile app. The complexity that the mattress comes with has placed it at $799 price mark which is more than 8 times the cost of a normal mattress. Offering high-quality services to the customers in return of regular fees is one of the most preferred ways of IoT monetization. It doesn’t just help create a continuous inflow of revenues but also establish a strong customer retention plan. An example of this model is Volkswagen’s Car-Net. The smartphone-based service offers maintenance, navigation, security, and entertainment features to the users. With the mobile service, it also gives the users access to information like charging stations, parking information, fuel info, weather, online traffic information and a number of other useful information. The Service and Security Package also includes several online theft alarm, emergency call services, and scheduling of services. The monthly fee for this useful IoT app is $17.99 while the yearly cost is $199. The whole concept of IoT relies on the creation of an ecosystem of several connected products. The more this ecosystem is expanded, the greater is the value that gets delivered to the end user. Under this model, the platform/ecosystem’s founder gets revenue from both – end customers and the businesses using your platform. Along with the fees charged from the users of the platform, you can also ask for a share in the profit made from the product or you can offer APIs to companies for developing their own IoT applications. An example of this model can be seen in SmartThing.The company offers a central hub and a wide network of IoT products, both as the third party products and for in-house including environment sensor, locks, alarms, and switches. It offers an app for controlling the connected devices and hub in addition to supporting IoT developers for making IoT app solution on the platform with the help of guides. The hub that costs $99 has found partners in Sonos, Belkin, and Philips. With this, you now know how to make money in the flourishing industry that IoT has proved itself to be. The cost of building a smart device amounts to over 70-80% of the total IoT cost. A cost that ultimately depends on the type and complexity of the solution that you wish to create. Analysis – Budget planning, concept development, technical requirement specification, and cost optimization. Modeling – It takes industrial designers and engineers to develop the PCB layout schemes and gadget’s interior elements. Prototyping – Usually the hardware device manufacturer developers over 10 PCBs and then debug them, modify them according to the changes mentioned in the documents. Testing – The prototypes that are successful are then transformed in the pre-production model that uses different materials for a device case. There are a number of tests which are then performed like climatic, pre-certification, electrical safety, and user tests. Network: The IoT ecosystem will fail to solve its purpose until it is powered by a highly scalable network infrastructure, high-speed connection, and low latency. An IoT connectivity is mainly enabled by short-range wireless cellular and the LPWAN solutions. So when your IoT app is made of a system of connected devices that connect over the cellular network, you will have to pay extra expenses. 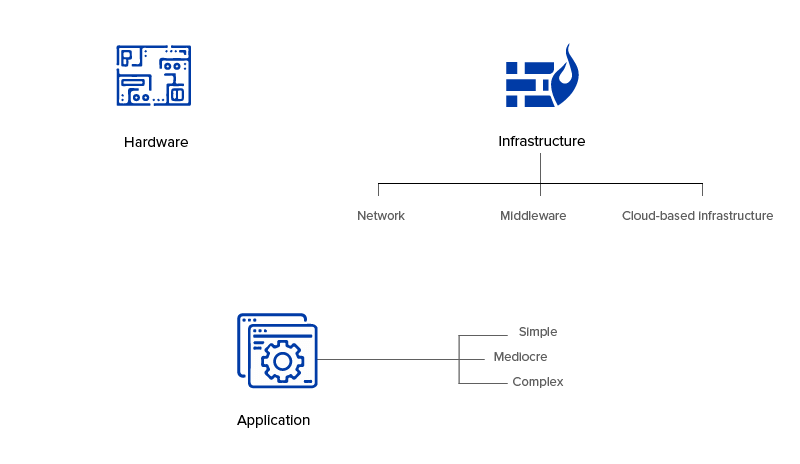 Middleware: In case you are thinking of incorporating ready-made 3rd party gadget in the IoT ecosystem, you will be needing a middleware – software that functions as an interface between two or more IoT components, hence connecting the devices that fail to do so otherwise. Cloud-based infrastructure: These are the storage software and solutions that refine the many gigabytes of raw data in something that is actually meaningful. Cloud storage tend to add in a significant amount of price tag in the IoT app development cost, what we recommend is that you should make use of the smart device connectivity and the data analysis by PaaS solutions developed by Microsoft, Amazon, or Intel. An IoT application, as your IoT development company would tell you, can be divided into three parts – Simple, Mediocre, and Complex – on the basis of development difficulty. 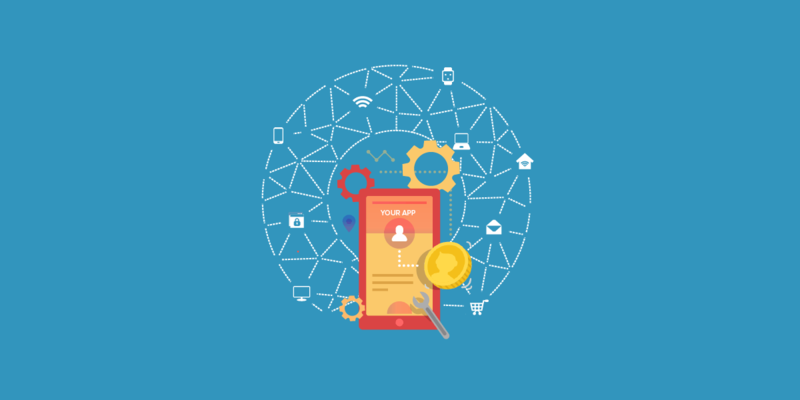 A factor that has a direct impact on the cost estimation for IoT app development. Simple: These apps work in sync with the custom tracker that takes around 300 man-hours to develop. Even though the application uses many elaborate programming tools for rendering the sensor data and producing information in real-time, we are calling it Simple because Internet of Things development belonging to the Simple category takes less than 500 man-hours. Mediocre: Apps which contain BLE to facilitate management of connected devices, visualizing data, and for sharing the progress on social media are categorized as Mediocre apps. They take somewhere around 1000 man-hours to develop and a medium range of cost to develop IoT app. Complex: The app that falls into this category is – secure iOS and Android mobile applications which are integrated with a number of radiation monitoring devices through Bluetooth with the motive to generate a report, send data to the cloud-based server, obligatory authorization, and a Pin code generator etc. takes up approximately 2000 man hours. And, if you are planning to add AI on the data which is collected on the device or implement your IoT application on an enterprise level, the hours of needed resource allocation would only increase. Now that we have looked at the factors that have a direct impact on the IoT app development cost, let us now look at the resultant number of the overall cost that you will have to pay for development of your IoT application. How Much Does IoT App Development Cost? The cost of IoT application development will vary according to the Internet of Things development complexity, which in itself is decided on the basis of the number of features added in the IoT app solutions. The application that can be categorized as Simple IoT app because of limited device connection possibility and lack of extensive features besides basic connection and rendering of information will cost somewhere around $30-40k. auto-learning feed, content management system, Data ingestion sources, and requirements for reporting granularity and Reinforced security standards, and several other high-end ones, will amount to around $50-80k. 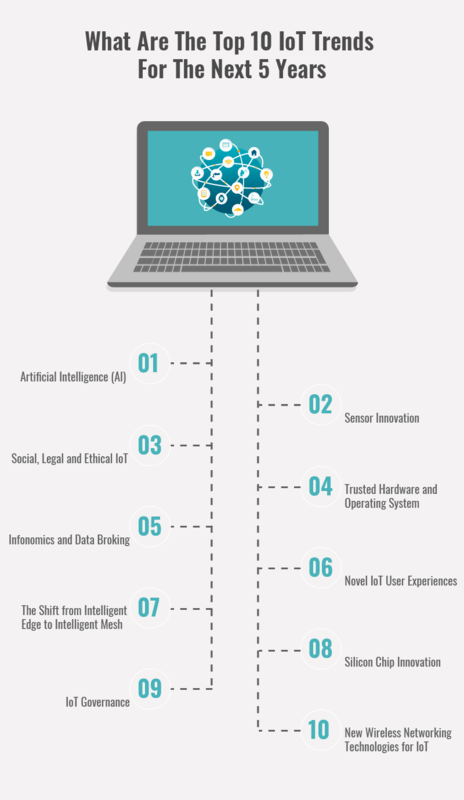 Now that we have looked at what the state of IoT market is, the platforms which can be used to develop an IoT app, the ways businesses can make money at the back of an IoT ecosystem, and the factors that contribute to defining the IoT cost along with the cost structure of an IoT application, it is time to look at something that is preventing the technology from reaching its true potential and how you with your IoT app development company solve it. There are a number of challenges/assumptions revolving around the IoT market that are known to impact the count of mass adoption across industries. Let us now look at what they are and try to look at the probable solution preventing those challenges. *The solutions that we are offering here are backed by the years of experience that our team has in delivering IoT development services. To control the IoT Development cost, it is recommended to have several “bite-size” IoT implementations having specific milestones and reasonable costs. Start with small steps and then invest in roll-out phases and to save the cost further, we advise our clients to use public infrastructure and software-as-a-service. One of the biggest challenge facing the IoT app solution industry is hacks and security breaches. And rightfully so, after all for an ecosystem that works entirely on internet connection, it can be a hornet of hackers. Data at rest: The data which is housed in the database in Cloud or in the application is known to be a Data at rest Employing a mix of software and hardware encryption methodologies would ensure that the security is intact in the data at rest. Data in use: The data which is in use by the application or a gateway which is accessible to the device or user is the most difficult form of data to secure. The security, in this case, is dependent on how strong the authentication process is. Data in flight: While the modern cryptography algos can make it impossible for the hackers to get into the IoT ecosystem, what about the data which is accessed in flight mode? For those data, decoupling the information-only data from the action data – with the help of encrypted, outbound communications, lowers the vulnerability when the data is transmitted in flight. You should also set the device to fire and forget in order to enable the device to generate measurement and then discard the complete measurement data. While there are many IoT standards in the making, there is a huge lack of a universal standard in the IoT industry. The solution of this is nothing but to wait. Agencies like IEEE and The Open Connectivity Foundation are working in the direction of creating a common IoT language which would lower the efforts needed to share the information among the competing platforms. With this, you are now prepared to not just make an appearance in the flourishing industry but also rule it. Let us end this chapter of your preparation to be a medium to connect the world by giving you an outlook of the future that you are going to be a part of. Where is the IoT Industry Headed? Now that you have looked at it all, the only remaining step is to get started with your own IoT solution. Contact our team of IoT application developers and get connecting.